As the one who did the PWR Live: Homefront preview, I summed it up best when I said that Quatro had the “fastest rise from pre-show to the main card.” 2018 has been very gracious to this guy and he truly deserved every opportunity he got. Ralph Imabayashi versus Quatro was a match that felt like a natural progression for both men because of how complementary their styles meshed. It was the perfect mix to appease a red-hot crowd who wanted to up the ante with every match on that card. It was a match we never knew we wanted and it did not disappoint. I was there (you can even see me at 01:39 in the video) and I can assure you all, while the whole card was stacked (I even considered this show the best to date prior to watching PWR Vendetta 2018), this was the only match in the card that had all of the people in the crowd gasping and standing because of how close the match could have gone. Even the pre-match introductions involving Rederick Mahaba and the returning Trabajador Supremo were golden. Both managers were able to give their respective clients—or protégé, in Quatro’s case—the hype that they truly deserved going into the match. The match itself started out a little in Quatro's favor. His solid fundamentals and strong basic wrestling skills caught the champion off-guard. While I'm sure Ralph knew that the Lightbringer was quite talented, surprisingly, it felt like he got more than what he bargained for when Quatro started to pick up momentum and mount a continuous offense. At around the 13-minute mark, Quatro started to get comfortable with his offense, dishing out high-flying dives to the outside and to the inside as well. However, this was where Ralph would gain control once again. After a carefully timed counter to a springboard dive to the inside, the champion would lock in his carefully defined submission game. When Ralph eventually got control of the match, this is where the match had a short lull. It wasn't bad per se since it was actually smart for the champion to keep his otherwise explosive opponent grounded. After all, the first few minutes of the match did hurt and could have contributed to his downfall later on. A few minutes of lock-ups and submissions didn't really hurt the match as it helped give Ralph breathing room against Quatro. At this point, I thought to myself how awesome it was that this match showcased both wrestlers in terms of ring psychology. Quatro was the hotshot challenger who would throw his body on the line to get every bit of offense to count, and Ralph Imabayashi was the champion who wanted to extend his title reign—the longest PWR Championship reign to date—by playing it safe and sticking with his gameplan of keeping his opponents' limbs at bay. One of my favorite spots in the match was when Quatro mounted his comeback. The corner reversal into a Backstabber might be a spot that not only caught my eye, but also of the whole world as well – eventually making its rounds on wrestling Reddit (albeit this was from a different match). This would be the start of the whole arena chanting for the one and only Quatro. The two would trade finishers—a Destino from Quatro and a Sonic Crusher from Ralph Imabayashi—which both would kick out of, much to the clamor of the crowd. It looked like Ralph finally found his match, someone who could possibly take the title away and stop his dominant reign. Towards the end of the match, a second Destino attempt would knock the referee out and prompt PA Artie and Rederick Mahaba to try and help the champion via nefarious means. This would backfire when Imabayashi got hit by a Mahaba shot to the face with the title. A belt shot to Mahaba would then follow, giving the challenger an opportunity to have a fair chance to win. An awkward Artie interference would also occur thereafter, only to be thwarted by our challenger. It felt like the odds were in Quatro's favor. The crowd immediately erupted upon sensing that a title change could occur. Quatro would again pull a Destino out of nowhere to gain the 1, 2, 3 and become the NEW PWR Champion... or at least that's what the crowd at the Power Mac Center Spotlight thought when they bared their hearts out, while rejoicing what they thought was the end of Ralph Imabayashi's reign. It turned out to be a dusty finish, one that played with the hearts of everybody in the room. The cheers would turn into jeers when the referee noticed that Imabayashi's foot was under the ropes, thereby counting the pin as invalid and therefore announcing that the match was to continue. A short back-and-forth later, Ralph would reverse a Quatro kick into a submission and then a roll-up pin attempt to secure the victor. It was a cheap win, but it was one that would extend the champion's reign up to the present day. This match played with everybody's emotions a lot. It was a good test to see what would happen if Ralph Imabayashi lost the title, but more than that, it was a better test to get a feel on how Quatro would fare in the main event scene. The test was a success. 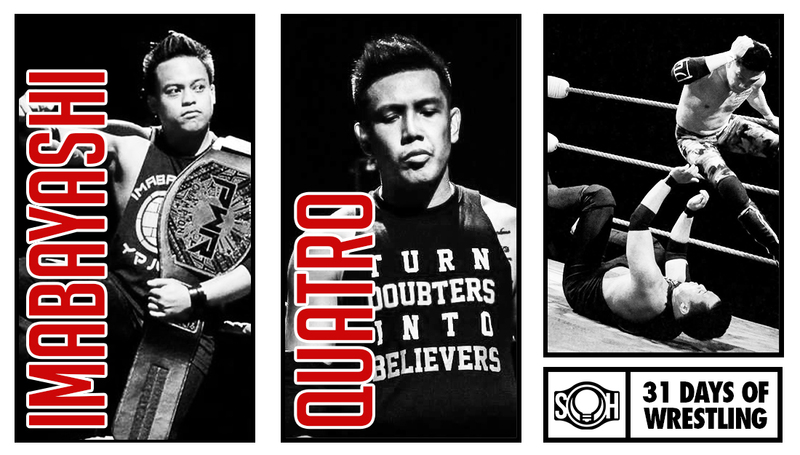 Quatro may have lost the match, but he won the hearts of everybody and showed all doubters and non-believers that he was here and that he deserved every chance he got. He put his foot down as if to say that he is ready for the spotlight.